Notes: Live video (and a video saved from earlier) from a bluetit nest in Clarke Brunt's garden. Click to start. I don't guarantee that the video will remain online, or will be working at any given time. I have limited the number of people who can view at the same time, so try later if it doesn't work. I might reduce the image size or quality further if too much bandwidth is being used. 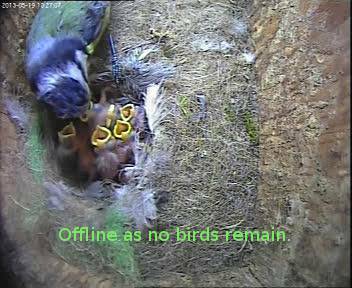 Live action from the bluetit nest. 2013-May-30 One young bird was still alive and being fed this morning, but died shortly afterwards. Perhaps it was all too much for a single parent to find food, and maybe two consecutive days with rain, no sun, and temperatures around 12C during the day didn't help. 2013-May-28 The lone parent continues feeding the young ones. One definitely died yesterday, and another today - the adult bird spent about 15 minutes trying to remove it from the nestbox, and eventually succeeded. Evidently something got stuck on the camera lens during this, so there is a blurred patch in the centre. At least 5 of the original 8 young ones are still surviving - perhaps they are reducing to a number that one adult can manage to feed? 2013-May-26 I think that one bluetit was taken by a sparrowhawk this morning. Certainly some small bird was the victim, and there was then about a 10 minute gap in feeding. Anyway, the young birds are still being fed, though it will be harder work if there is only one parent. Will have to see whether I ever see 2 on the video, but it's getting difficult as the action gets closer and closer to the camera. 2013-May-25 At least 8 young birds seem to be flourishing, despite the unseasonable cold last night (only a few degrees above freezing). 2013-May-16 Just after 10am, the first young bird hatched, quickly followed by a second, and by the afternoon there were four. 2013-May-5 The 10th and final egg was laid this morning (one a day for 10 days). Two minutes of 'highlights' recorded on 30th April 2013.